A picturesque corner of Wales offering wonderful beaches, stunning coastal scenery and quaint villages, join us to explore Britains first coastal National Park. Monday  After joining the coach from your taxis we make our way to Wales. A lunch stop in Hereford before continuing to our hotel in Fishguard. Tuesday  We have a guide joining us today to explore the history of the area, a magnet for artists and crafts people. The day will include a visit to a craft studio to see craftsmen at work, galleries and studios can be explored at leisure including St Davids, the smallest city in Britain. Wednesday  A gentle day at leisure today to spend in and around Fishguard. 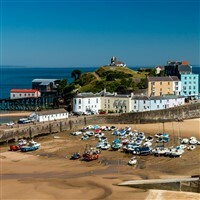 Thursday  Today we visit the seaside resort of Tenby with its rich, sandy beaches. We are including a boat trip to Caldey Island inhabited for centuries by Cistercian Monks. Friday  We leave the hotel this morning and head for Cardiff, Wales vibrant capital. We are including a cruise around Cardiff bay and free time for lunch before continuing home and your waiting taxis in Wiltshire. A splendid Victorian hotel nestled into the cliffs with spectacular views over Fishguard Bay.